Richard, Aaron, Whitney, Mercedes. Copyright © 2016, FPP, Inc. All rights reserved. A smaller crowd tonight—possibly because many people are so busy working…which is great! We returned to the Pre-Dinner Social Hour Format, which was very well-received. 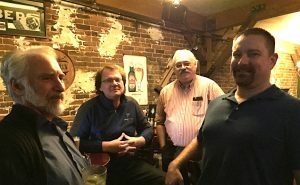 People had a chance to meet and greet four newcomers, and to catch up on the latest news from the regular attendees. Frank, Michelle. Copyright © 2016, FPP, Inc. All rights reserved. Software Craftsmanship MeetUp last Tuesday: Several people gave five-minute tech talks. Read about the meetUp here. Documenting code: This is becoming very complicated with all the IDEs that are incorporated into an application; sometimes involving tracking breadcrumbs to locate what the heck the code was intended to do. Sometimes, the documentation is simply too much; e.g., 8 lines of comments to explain a couple of lines of code. Other times, there are so many modules to research that the search becomes more of a time sink. All agreed that documenting is good, as long as it’s brief and relevant. UI/UX: Front-end web developers were describing their backgrounds and interests. Jobs: Students (RCC and SOU) talked about their courses and were interested to learn about local opportunities for after graduation. Good to see that students are networking! Even after an exhausting day (12 hours, in some cases), people turned out to meet and greet other techies; to catch up on news and hear about possible career opportunities. Gordon, Ben, Dave, Francis. Copyright © 2016, FPP, Inc. All rights reserved. 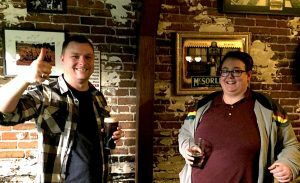 Join us next month, on the First Thursday in December, which happens to be on 12/1/16, at 6:30 p.m., at Four Daughters Pub in Medford, upstairs, in the back room. We have the space reserved from 6:30 – 7:30 for social hour, and the tables across from the upstairs bar are reserved for our group, starting at 7:30 p.m.